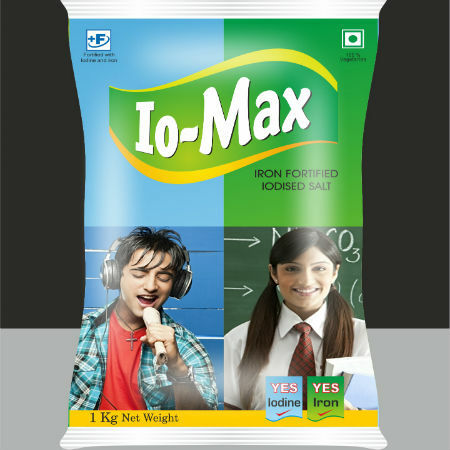 Iron and iodine fortified salt - the next breakthrough for tackling iodine and iron deficiency in the country. Double Fortified Salt (DFS) is an innovative new fortified food product - delivering small but crucial amounts of iodine and iron to human beings through their diet. In general, DFS formulations are intended to provide 100% of daily dietary iodine requirement, and ~30 to 60% of daily dietary iron requirement. Dual fortification of salt with iodine and iron could be a sustainable approach to combat iodine and iron deficiencies. 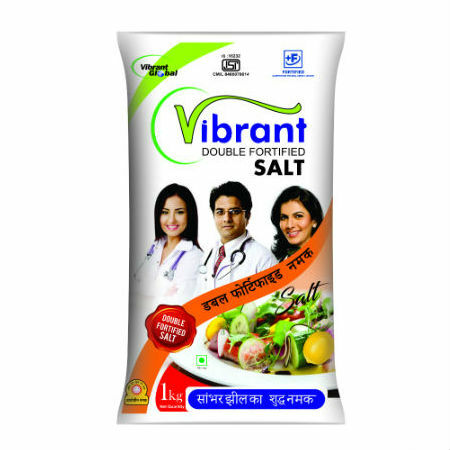 India?s National Institute of Nutrition (NIN) has pioneered the development of double fortified salt (DFS). NIN has also taken the initiative to transfer the technology to iodized salt manufacturers in the country and provides continuous quality control support. The Micronutrient Initiative has developed DFS with encapsulated iron. 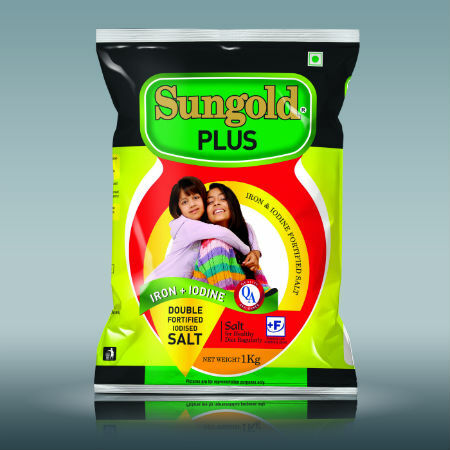 In 2009, the Ministry of Health and Family Welfare has endorsed the addition of iron in double fortified salt at 0.8-1.1 ppm (mg/g of salt). Every year nine million pregnant women and eight million newborns are at risk of iodine deficiency disorders (IDD) in India. IDDs are linked to iodine deficient soil. Due to glaciations, flooding, rivers changing course and deforestation the iodine present in the top soil is constantly leached. This, in turn, leads to deficiency of iodine in crops grown on iodine deficient soil with consequently low iodine in the diet for livestock and humans. 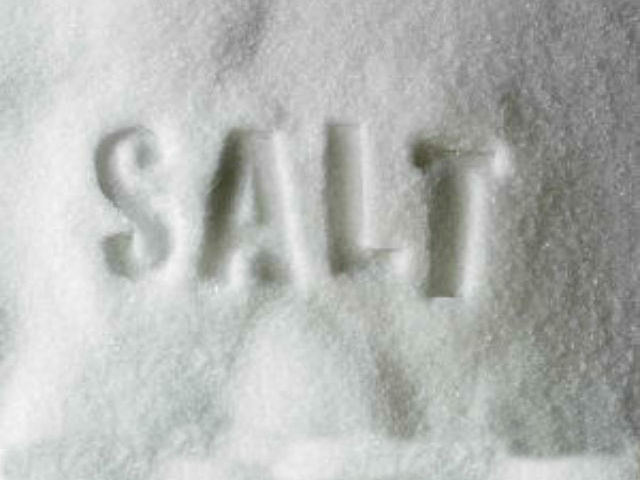 This deficiency of iodine in the diet can be addressed by fortification of salt i.e. adding iodine to salt. Salt has been identified as an effective vehicle for iodine because it is consumed almost daily and universally. Iodine deficiency disorders (IDD) comprise of a range of disorders including goitre, hypothyroidism, cretinism, brain damage, intellectual disability, psychomotor defects, hearing and speech impairment, abortion and stillbirths. Intelligent Quotient (IQ) Children born in iodine deficient areas have 13.5 IQ points less than those in Iodine sufficient areas A majority of the consequences of IDD are invisible and irreversible, but at the same time, are totally preventable. IDD constitute the single largest cause of preventable brain damage worldwide. In India, due to lack of iodine in the soil and therefore in the diet, all1. 2 billion people are at risk of IDD and around 264 million people are at high risk. India has the largest number of children born vulnerable to IDD. Currently, 92% of the population consumes iodised salt in India. Adequate salt iodisation in India has saved 4 billion IQ points in the last two decades. The efficacy of DFS in reducing anaemia and iron deficiency is proven. DFS providing 3.3 mg ferrous fumarate per kg of iodized salt led to significant improvements in haemoglobin, ferritin, soluble transferrin receptor and body iron among female Indian tea pickers in a period of nine months . DFS has been evaluated in the controlled trials in tribal communities and in residential schoolchildren in both urban and rural setting with positive impacts. The Ministry of Women and Child Development has directed the mandatory use of DFS in the ICDS and MDM national programs (2011). In terms of its reach, DFS can reach the most vulnerable children through MDM, ICDS (150-180million) and general population through open market channels. The cost that was a major barrier has been brought down and DFS is now available at Rs.7.5 to Rs. 12 per kg. 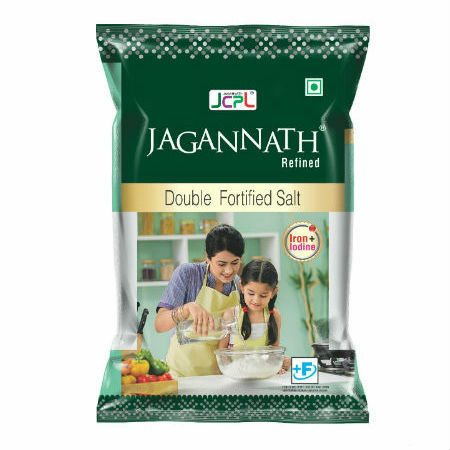 Double Fortified Salt (DFS) is an innovative new fortified food product - delivering small but crucial amounts of iodine and iron to human beings through their diet. In general, DFS formulations are intended to provide 100% of daily dietary iodine requirement, and 30 to 60% of daily dietary iron requirement. DFS is produced by mixing iodized salt with either/or ferrous sulphate/ encapsulated ferrous fumarate. While producing DFS with ferrous sulphate, sodium hexametaphosphate (SHMP) is used as a stabilizer, ferrous fumarate has been encapsulated with soya stearin to prevent interaction between iodine and iron. 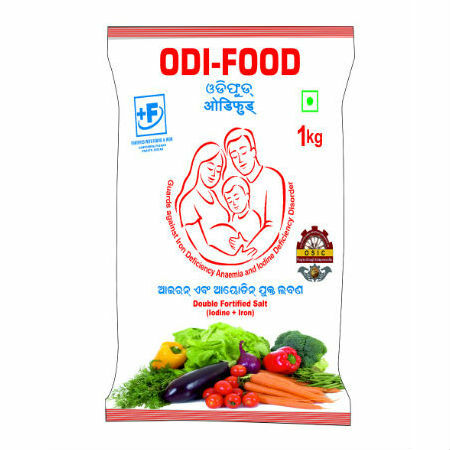 DFS as a product is stable in both formulations, is indistinguishable in taste, color, and smell from regular salt and has been proved efficacious in addressing IDA (Iron Deficiency Anemia) and IDD (Iodine Deficiency Disorder). The salt iodization process involves very little technology of using a drip feed equipment to dose potassium iodate (KIO3) solution to the raw salt to a very sophisticated dewatering, drying and packing system. DFS technology can be easily integrated with little modifications in existing iodized salt processing facilities by adding a ribbon blender to blend the iron compound to iodized salt to produce DFS. Given limited commercialization of the product, the incremental cost per kilogram of salt on account of addition of iron remains unclear. However it is anticipated that the increase in cost of DFS could be 20-50% higher than iodized salt per kilogram. India possesses sound technology to produce DFS which is stable, bioavailable, effective and safe. There are many technologies available to make DFS, prominent being the NIN technology and Micronutrient Initiative technology. Both are available in India and many iodised salt producers have access to the technologies and capability to produce DFS. 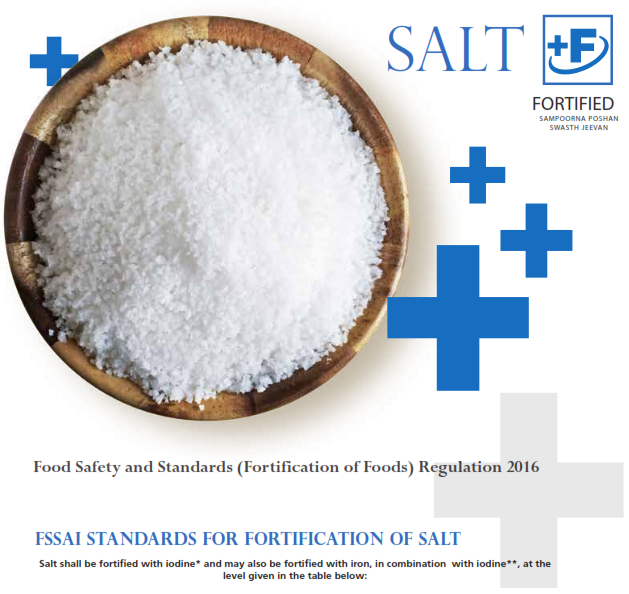 Food Safety and Standards Authority of India (FSSAI) has approved production of DFS by mixing iodized salt with either/or Ferrous Sulphate and Encapsulated Ferrous Fumarate. While producing DFS with Ferrous Sulphate, Sodium hexametaphosphate (SHMP) has been used as a stabilizer, Ferrous Fumarate has been encapsulated with Soya Stearin to prevent interaction between iodine and iron. 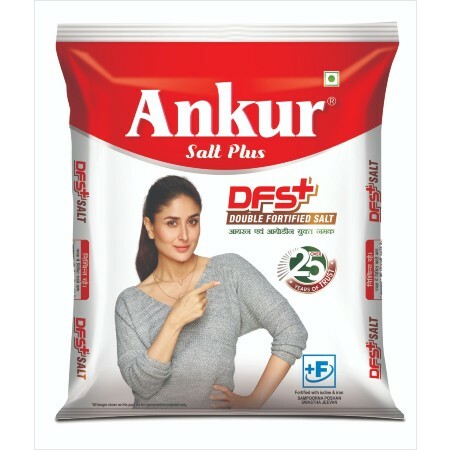 DFS as a product is stable in both formulations, is indistinguishable in taste, color, and smell from regular salt and has been proved efficacious in addressing IDA and IDD. DFS technology can be easily integrated with little modifications in existing iodized salt processing facilities by adding a ribbon blender to blend the iron compound to iodized salt to produce DFS. Given limited commercialization of the product, the incremental cost per kilogram of salt on account of addition of iron remains unclear. It is however, anticipated that the increase in cost of DFS could be 20-50% greater than iodized salt per kilogram. There are commercial brands available which costs from INR 14 to 25 per kilogram of DFS. Tata Salt played a pioneering role in iodization of edible salt in the 80s which eradicated goiter and Iodine Deficiency Disorder in India. 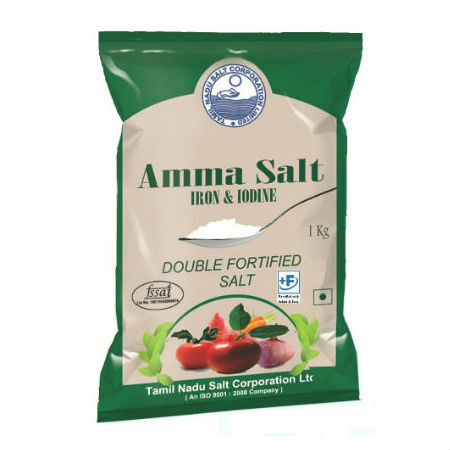 Since salt is an excellent micro-nutrient carrier, Tata Salt took up the challenge of addressing the Iron deficiency led anemia. Working with NIN, Double Fortified Salt was developed containing Iron and Iodine in 2012. Since then, the product was piloted under the name 'Tata Salt Plus'. 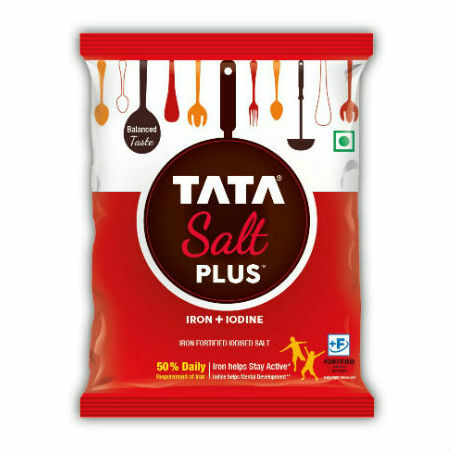 In 2015, 'Tata Salt Plus' was launched nationally backed by strong TV campaign, educating the masses about the benefits of Iron. 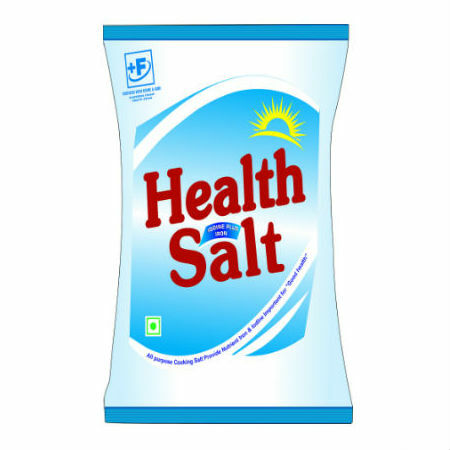 Currently, 'Tata Salt Plus' reaches about 6 L households across the country. In collaboration with the University of Toronto, Canada and assistance from TATA TRUSTS (The India Nutrition Initiative) and IDRC, Canada, Wella Nutrologicals has set up a state of the art five metric tonne per day plant in Jaipur, Rajasthan, for the manufacture of encapsulated ferrous fumarate (EFF) premix for producing double fortified salt (iron and iodine). 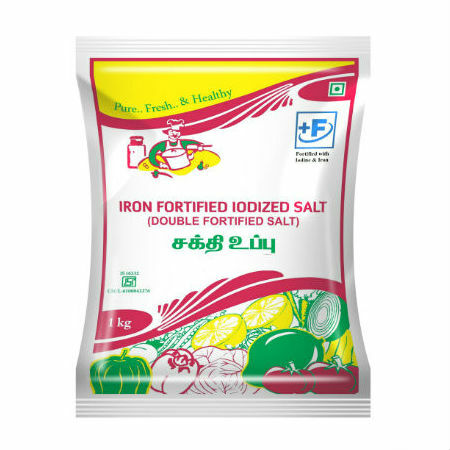 This premix is very nicely quoted and then encapsulated so that there is no exposure of iron and also the iodine in salt remains absolutely safe. The premix produced at Wella has been procured by big salt manufacturers and used for double fortified salt in Uttar Pradesh and now in Jharkhand. A total of approximately 30,000 metric tonnes of double fortified salt has been produced with the premix from Wella. Some private sector food companies are in talks with Wella to launch their brand of double fortified salt using our premix. Sahayamatha Salt Refinery Pvt. Ltd, are the largest producers of common salt, refined iodised free flow salt, double fortified salt and low sodium salt in South India, having two plants at Veppalodia and Kalloorani, Tuticorin district. Sahayamatha Salt Refinery have signed an MOU with NIN for DFS on 5/12/2016 with plant capacity for DFS free flow at 10,000 MTonnes per annum and DFS crystal at 10,000 M Tonnes per annum. They are marketing DFS in Kerala, Tamil Nadu, Karnataka and Andhra Pradesh. - Sahayamatha Salt Refinery Pvt. Ltd.